I move from Brazil and into Spanish lit from Central America. Claribel was born in Nicaragua but considered herself Salvadorean and was a driving force in central America woman’s literature she wrote ion many styles Poetry and Novels. She also wrote non-fiction and this book follows one of the female rebel leaders of the Guerilla war in El Salvador. Claribel also translated a lot of Poetry into Spanish particularly Rupert Graves. She also compiled one of the earliest collection of Latin American boom works “New Voices of Hispanic America”.She also won the Neustadt prize. It was 4 january. Only thirteen days ago. she had barely three and a half years to spend with Javier. They conversed intently while Ana Patrica played with her rag doll. They had reviewed their seven years together, four of them spent in hiding. They remembered the threantened miscarriage and congratulated themsleves on the happy outcome, there in person and tugging at Eugenia’s hand that she come and take a look at a caged bird. Was it going to be the last goodbye? From the opening chapter one fo the last meeting of husband and wife the caged bird mademe think of Maya Angelo poem. I was pleased to have found this old woman’s press copy of this book. The book follows the life of a Female Guerilla leader one Commander Eugenia a female leader that inspired her fellow female freedom fighters. Claribel follows her life from her early years her father died when she was and looking after her sister as the eldest of the three. One of her sisters recalls her taking her to see the slums. Her parents were Christians and had fled from Nicaragua when Ana (Eugenia real name). We see her being drawn to the parties that oppose the government and then into the guerilla movement. She meets her partner Javier. They also had children we see as she crosses the countryside in just her sandals. Even working whilst she was pregnant. We follow her life on the run through her comrade’s eyes and reportage of what she did. A story of a woman who fought for her cause and gave her life for it. My mother has a very strong character, and Eugenia inherited this from her. My mother never became overwhelmed in the face of difficulties.There is a inherent contradiction in this. People would say to us :”Your mother is a widow and you have to help her out”, but the the truth of the matter is that she would never be helped. She ran the buisness all on her own. Previousluy, during the daytime, Eugenia used help her, and at nught she completed the shores and studied. Later ion she abandoned the income producing work and carried on with the housework and attending University. I spent several months with my mum but from then on we were committed to the revolutionary struggle. Ondina was still at school. I left home, I really wasn’t capable of maintaining the buisness, and we had skills more relevant to the people. Marthe Eugenia sister saying her mother had the same grit as her sister did that drove them all forward. I am a pack rat when it comes to books. I am a devil for second-hand bookshops as I am always wanting to find books like this lost gems. The conflict in El Salvador is a conflict I remember from my youth. I find it strange how much our news coverage has shrunk over the last few decades we used her a lot more about conflicts like this one. This is a well-drawn account of one woman but in her account is a reflection of a hundred or thousand other women that took arms in the Guerilla wars that swept across Central America through the later part of the 20th century. It shows the journey of many people from events in the childhood that made her poltical. The cause that drew her further in the man she met that shared her cause. I was touched by her story. Now I saw this shortly after it came out in the summer, I was searching for some Bernhard books and this from a writer I have featured twice before on the blog appeared . Horacio Casrtellanos Moya is an ex pat salvodoran writer, he has written eleven novels . This book is the reason he left El Salvador when it came out is was considered to political many calling for it to be banned and his mother received death threats and Horacio himself fled. He now teaches at Iowa university. The hatred is clear in this passage near the start of the book Vega hatred of the place . Now the title is a give away here the book is very much an homage to the style of writing that Thomas Bernhard became known , so the book is a single paragraph and in the best Bernhard tradition the main character is miserable . The book is formed of a couple of hours one evening between to men . Vega a professor how escaped the country and was living in Canada till his mother died and a writer called Moya (another nod to Bernhard he has put himself in his books as well) Vega is talking about the country and the way it has changed and go down hill a tirade against Salvador of the time but this is somewhat tongue in check in style there is a dark humour at times. This is a classic pub scene in a way with two men talking about the world one returning has seen the world and wants to tell his friend about how bad this place was .The Bernhard connection is also the last lines of the book as Vega took his name as an alias back in the day as he liked him as a writer. Television is already a plague; sure, in Montreal I don’t have a television, but here at my brother’s house, where I’ve stayed until this morning, they’ve forced me to watch television whilst eating meals; you wouldn’t believe it, Moya , the television is in front of the dining table,it’s horrible , you can’t eat normally, you can’t have any sort of normal meal, because of television’s on ready to disturb your nerves. I like this part Bernhard but also partly hilarious in its tones from vega . I loved this short book Moya is a marmite writer I think you will either love his works like I do or hate them they tend to be grim and like this rather uneventful but full of life , it is easy to see why the book when it came out twenty years ago but not long after the end of the civil war in El Salvador a glimpse into the abyss that was the country before told by Vega and the way he saw the peace. This book is also an homage to modernism ala Bernhard but also Joyce with the action taking place over the space of two hours in an evening as the two get drunk and try to relive their earlier life . Have you read a Moya book , never sure why he isn’t as considered as highly as Bolano for me he is actually a better writer and in this translation Lee klein has brought the Bernhard side to life for me.He is the master of capturing those dark times of the late 20th century in central america where violence , dark police forces and violence where just below the surface. I read a couple of years ago Senselessness by Moya .He is one of the hidden gems of south american writing able to open the lid on all that is brutal in latin america .I feel he is best summed up by his friend Roberto Bolano in this quote from the cover . The only writer of my generation who knows how to narrate the horror ,the secret Vietnam that Latin America was for a long time . He has spent a long time away from Salvador ,first he went Mexico where he was a newspaper editor ,then Spain and germany he did briefly return to Salvador in the early nineties but currently lives in Mexico . 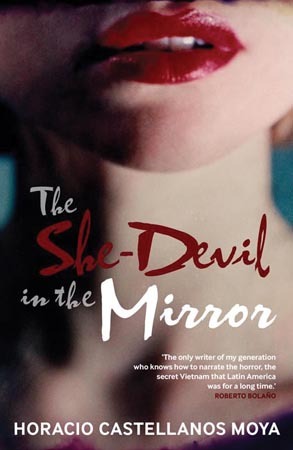 Weill the she devil in the mirror ,could be called a detective novel ,but it is a detective novel in the latin american vein IE not really a straight forward detective novel , a crime as happened we see it solved through some one but not the detective .The crime a woman has been killed her name is Olga Maria ,she owns a boutiquein the posh part of town and is in her late twenties .The person telling the story is her best friend Laura Rivera .We get the story told in one long monologue .This is a different vision to most Latin american novels as these are the upper class. We also meet the detective Deputy chief Handal .We follow Laura as she sees her friend’s life taken apart to find out what happened . They let me know right away :Sergio ,Olga Maria’s brother called my house and said something terrible had happened ,Olga Maria had been “mortally wounded “during an attempt robbery .That’s what he said “mortally wounded” .I couldn’t believe it – I’d been with her just half hour earlier . Laura learns her friend is dead . The main thing we see through Laura’s monologue is what secrets do ,the is a feeling that the husband was wrapped up in something very suspect to do with money .As we she her try to find out among the people they knew in the upper reaches of Salvadoran society .Which may to be blame for the death of Olga Maria .Also what her husband was up to as the past starts to unfold his part in this maybe more . This cappuccino is delicious ,Isn’t it ? you can tell it’s a real cappuccino ;in most places they just whip up the milk a little and pour it into any old coffee and call it a cappuccino ;what a fiasco . Laura is a very lady like lady . That quote shows how the monologue does sometimes get sidetracked by Laura as she tells us about the world around her and like in this example where to get the perfect coffee .We also maybe wonder at times how close Laura was to Olga and how reliable is what we seeing through her eyes is .So the journey isn’t straight forward to who killed Olga Maria but it is an interesting and eye-opening one .Also with a twist in a tail as Laura and Handal find out the truth . Moyahas pulled a gem here ,Monologues are hard to write ,with seeming stayed or contrived .I read Trevor’s review last year he compared it with Hamid’s reluctant fundamentalist ,I agree with his view that this works better than the Hamid did ,Moya tends to turn the screw of the case being solved a little smoother than Hamid did .But I also think he may have used Camus.He also used monologue in his last novel” the fall “I do wonder if that book is maybe nearer Moya’s vision in this book as like Camus this book sometimes drifts into the dark places humans can make for them selves . Have you read Moya ? This book is one of the rainmaker series of translation .i found this book particularly hard to read as it has very long passages and in places is very violent and sexual ,but in other places has some funny description . it follows a writer as he is reviewing and editing a 1100 page document about an indian massacre in an unknown central american country but as Moya has lived in el Salvador and Honduras you can draw your on conclusions to where it is set ,the writer is undertaking this for the church and the is an under current of them wanting him to less the impact of what had happen to the indians .The writer himself likes to have a drink in the local bars and seduce young women .there is a beauty to Moya’s prose they seem to flow seamless of the page .This was the first book by Moya to be translated in to english .wonderfully by Katherine silver .It is worth reading as there isn’t many book published in english from this region and is only short at 144 pages . In order to celebrate my first day of work as god intended i arranged to meet my buddy Toto at noon at El Portalito ,the city’s legendary cantina ,fortunately located a mere two hundred yards from my office close enough to prevent the onset of anxiety in someone who is afraid above all else of being punctual as is the case with me ;someone who requires a drink to calm his nerves at the strangest moments . from the 2nd chapter opening .